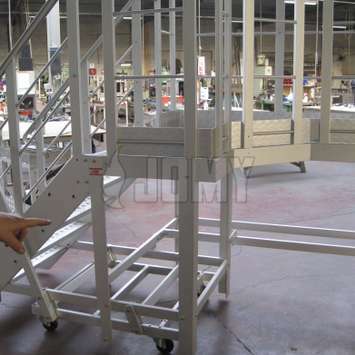 Aluminum stepladders can be provided with an access platform. This platform creates more working space so that it is possible for workers to move around in a comfortable and safe way at heights. 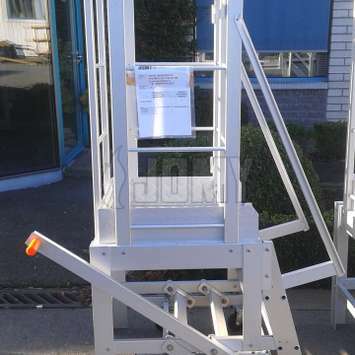 A very flexibel aluminum workingplatform that is usable in every environment. 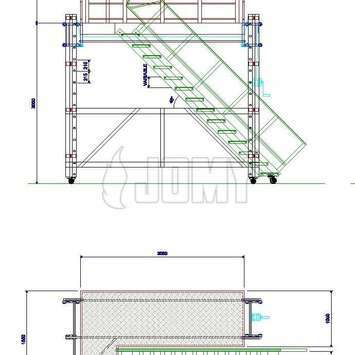 The JOMY engineers developed a new working platform and this made from our standard profiles so the platform is in anodized aluminum. 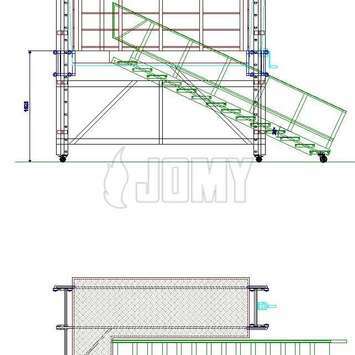 As usual JOMY combines here the strenght and the light weight of aluminum to come up with a very practical multi-use platform. 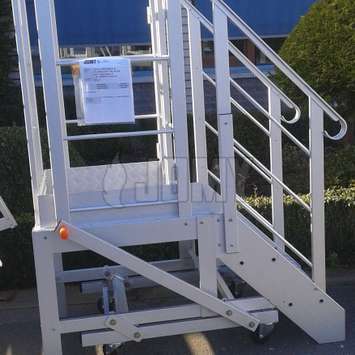 The height can be adjusted by hand via a system that is very reliable. 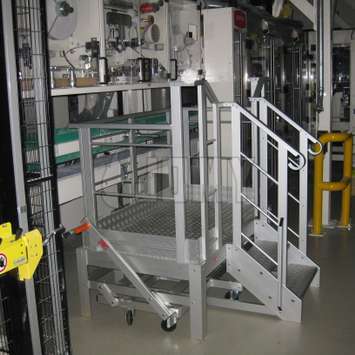 To secure the platform at a certain height there are mechanical interlock systems forseen on the vertical beams. 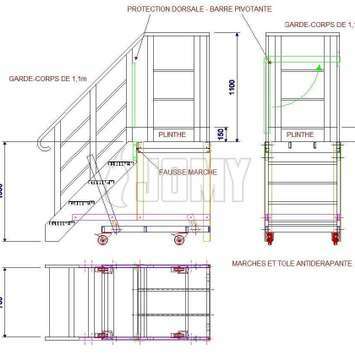 The flight of stairs that is forseen to get up to the platform adjusts itselfs and stays safe to be climbed. 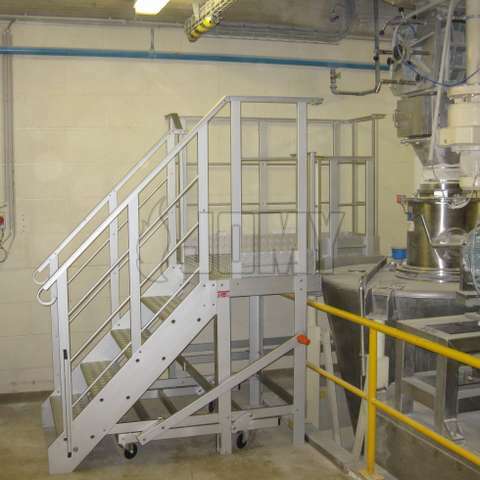 The whole construction has been calculated on strength and checked on safety. 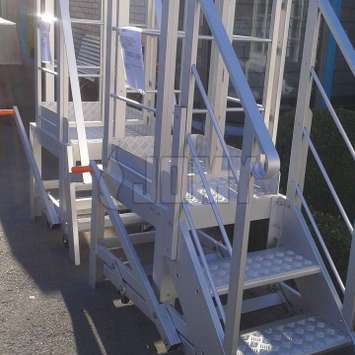 This is a working platform that will safe you time and will avoid accidents for workers when work needs to be done on heights. Quality and safety is at a high priority at the research center of Total and for this they have chosen to work with JOMY. 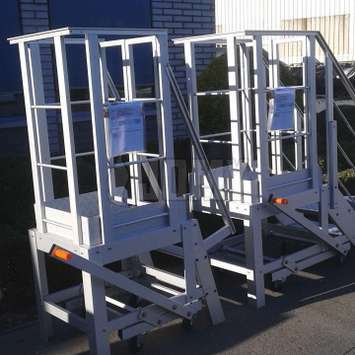 Here you see pictures of two mobile industrial working platforms ready to be delivered at the Total research center in Feluy, Belgium. Made to their measurement requirements. The use of lightweight aluminum makes it possible to suspend the platform from the building as long as the platform elements remain relatively close to the building. 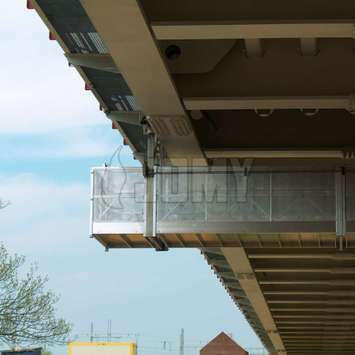 The JOMY mobile gantry hangs from the rail, and the rail is used as a ceiling for the structure. 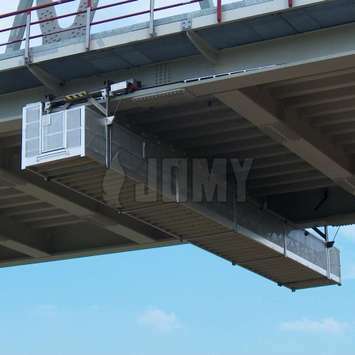 This is the ideal solution for safely reaching the bottom side of bridges, machinery, or the ceiling of a building for maintenance. The design of a hanging platform should not be taken lightly. Indeed, risks are so high that calculations of resistance and forces have to be exact from the start.